Chick Advisor - Free Neutrogena Pink Grapefruit! 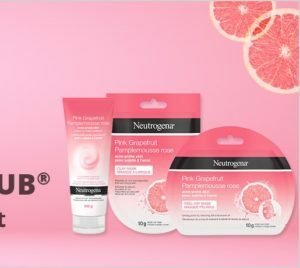 Home » Health & Beauty » Chick Advisor – Free Neutrogena Pink Grapefruit! Chick Advisor – Free Neutrogena Pink Grapefruit! Chick Advisor is looking for some female members to try three brand NEW products from Neutrogena Pink Grapefruit! These products are designed specifically for acne-prone skin, each product contains naturally derived grapefruit extract and works to remove dirt, oil, and impurities to leave your skin feeling clean, healthy, and soft — and did we mention it smells fantastic?! Neutrogena Pink Grapefruit Acne-Prone Skin Cream-to-Foam Cleanser: When massaged with water, this rich cleanser transforms from a cream into a layer of microbubbles that cling to dirt, oil, and impurities to unclog pores and leave you feeling squeaky clean. Neutrogena Pink Grapefruit Acne-Prone Skin Clay Mask: This clay mask absorbs oil and draws out impurities, leaving skin feeling clean and touchably soft. Neutrogena Pink Grapefruit Acne-Prone Skin Peel-Off Mask: Designed to remove excess oil on the skin’s surface, this liquid to peel-off mask gently peels away dirt, and unclogs pores. No rinsing required! Apply before February 26, 2019 for your chance to try all THREE of these fabulous products for FREE!